Now I have a div in which the background image changes depending on the link that is clicked! So after that I made another div with a higher z-index to layer over the first div and now I got two working layers to make a GAME-FACE + but wait! more and more graphics to make for the game and the face, it's obvious that this will be a never ending project. Nice, a RGB colour wheel be awesome, that way the different faces and games can be variations of the style and the user can customise the colour to their need, however I'm not sure how hard that would be to make. Keep up the great work Gameface, always great to see you start new projects! muahahaha ~ I figured out how to use the HTML5 canvas so you can right click and save the image after choosing which game and which face + check it out! ^O.P. with the original divs, you couldn't save the image after making your selection, I still have a long ways to go but the foundation is now solid. imma make one :)ive always had an idea of what i wanted one to be! = Best Avatar Idea wins a 10$ League of Legends Game Card!! general concept must be the same tho.. So to make things easier for the both of us, here's the templates for the resources. Easy enough? You don't ~have to make new graphics, just collect ones that will compliment the generator even more and make you a winner. a brain, can we get a brain for the top part? ^how about a purple one? ok no more requests until after the contest! sporting my new avatar, thanks! I was going to do another row of 8 icons on the bottom, but GeMinEye said that would be too much, Since I'm known for overdoing it, took his advice and made the space below the FACE the new "TITLE" field instead. I'll continue to add '-ER' titles, '-ER' as in Mapper, Scripter, Eventer, etc... if there's any titles that come to mind, let me know, they are easy enough to make. it's really down to adding more and more resources. 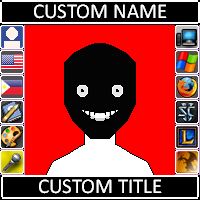 In time, I will disable right-click and make it so that you can upload your own graphic, choose your own colors, and click a button to download your new Avatar+Badge=GAME-FACE. as a reminder for some you who play League of Legends... brother swoop has put out a contest for $10 worth of RP for the best GAME-FACE concept, read above for more info. I'm still working on rewriting the completed canvas to an image you can download, once that's done, it's all about adding more and more resources. The once known "Gameface-Generator" has been split into two pages that will help make your online identity a snap!